A California road trip will take you along incredible coastal highways, through dense forests, stark deserts and over snowcapped mountains. I don't think there is any state in the US that is better for driving than California. We've taken a lot of road trips around the world and California is right up there as one of the best destinations for driving tours. This California trip planner will give you road trip ideas depending on where you are flying in to. We've taken routes from both Los Angeles and San Francisco. You can create a 7-day itinerary to a two-week California itinerary or an entire month exploring the state. It's easy to mix and match and start where you want. We hope to give you the tools to make your own plans and know what you'll see at each stop. Our guide will give you a sense of how much time you'll want to spend in each location, where to stay, and ideas for all the things to do at each stop! Click on the links below to skip directly to the section you'd like to explore. Mix and match to create one of the best California road trips ever! It seems that all of our drives in California start in San Francisco. It's a good central location that gives you the opportunity to go any way you like. I didn't include your stay in the city as part of the two week California itinerary, because you can spend a week exploring San Francisco. But if you want to spend a couple of days in the city, here are our suggestions for things to do! San Francisco is the perfect city to start any drive from. It's easy to fly into and car rentals can be picked up at the airport and traffic isn't as congested as it is in Los Angeles. Plus you get to start off driving over one of America's most iconic monuments, The Golden Gate Bridge. We have an excellent 72 hours in San Francisco guide where you can plan your entire stay, but if you have limited time, 2 days is enough. When we first visited San Francisco, we bought a City Pass and explored all the neighborhoods by bus. It was a great way to get acquainted with the layout of the city and have the option to hop on and hop off whenever we wanted. It's one of our favorite ways to explore any city for the first time. The bus started at famous Pier 39 where you can stroll along the boardwalk to find excellent dining options, shopping, nightlife and see the cute sea lions that laze on the wooden pier. A 24-hour hopper ticket works great to be able to take your time to explore. Even though we had a car rental, the bus was a nice way to explore as we didn't have to worry about parking or finding our way. 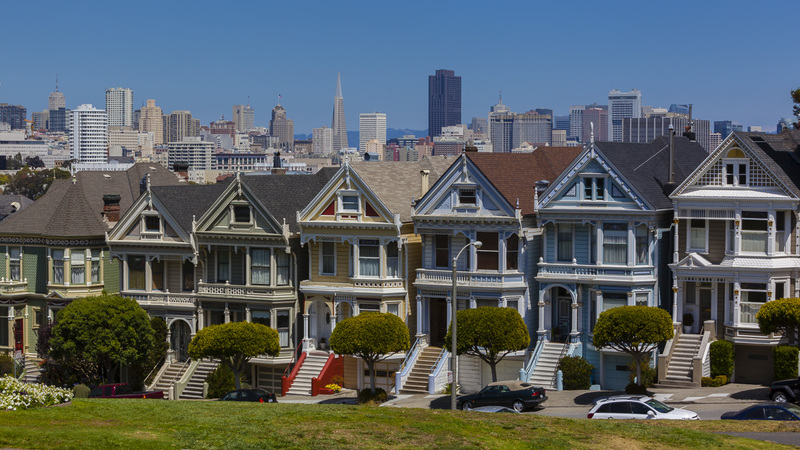 It took us to the major attractions like The Painted Ladies - made famous by Full House, The San Francisco Cable Car, the hippie district of Haight Ashbury and China Town. San Francisco has North America's oldest Chinatown and largest Chinese settlement outside of Asia. 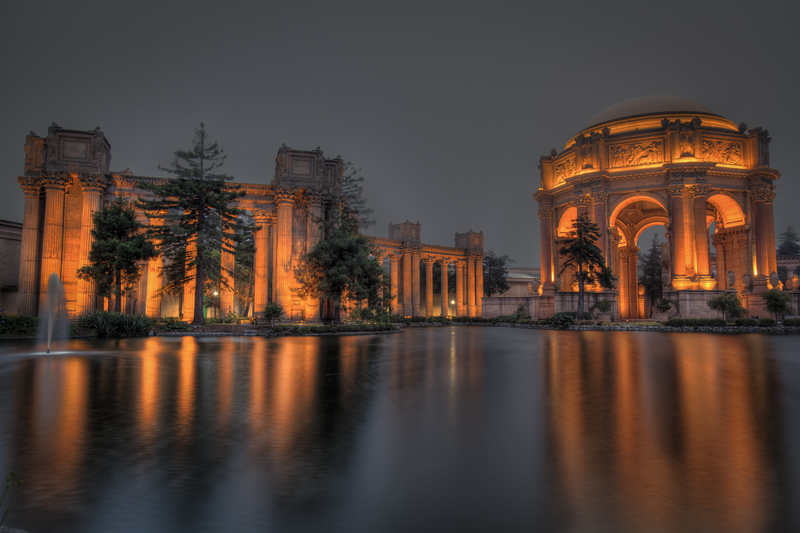 Once we were back in our car, we definitely drove out to Golen Gate park to drive over and take in the view of the Golden Gate Bridge and the picturesque Palace of Fine Arts. Driving time From San Francisco - 2 Hours 45 Minutes. You can stay in either Monterey or Carmel by the Sea, they are only 10 minutes from each other. Located just 2 and a half hours south of San Francisco, Monterey is a super starting point for driving highway 1. 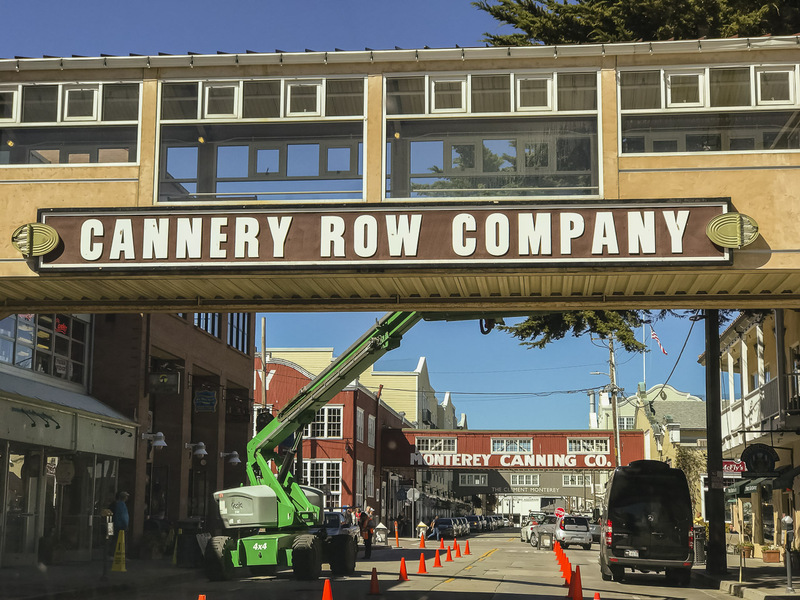 It's a very pretty town by the water and you must make sure to spend the day exploring the famous Cannery Row. Monterey was once a huge center for sardine packing and Cannery Row has been transformed from old warehouses to colorful buildings lining the waterfront filled with eateries and shops. 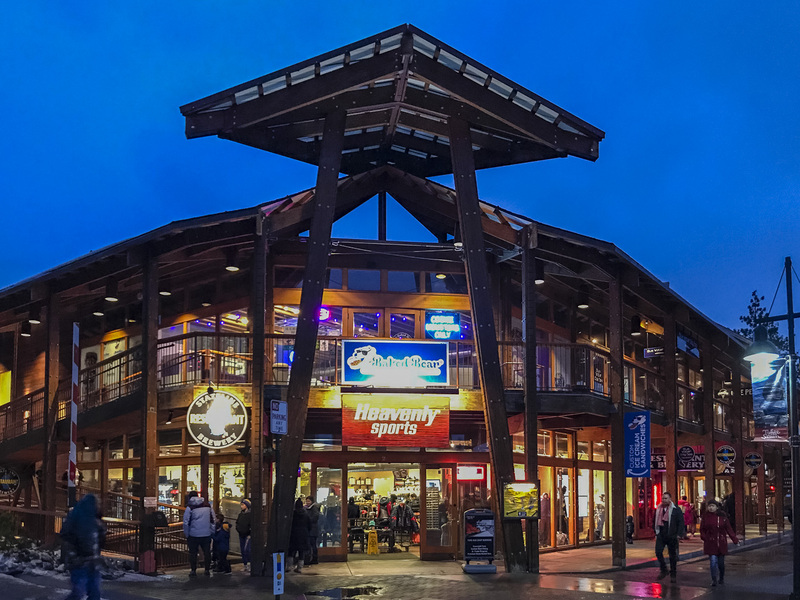 Be sure to spend some time wandering Cannery Row to do some shopping and dining. The waterfront spans from Cannery Row to the old Fisherman's Wharf. It's another good area for shopping, dining, and browsing historic buildings. The Monterey Aquarium is the centerpiece of the area where they stud the waters of Monterey Bay and tackle the oceans health problems. It was the aquarium's efforts that brought back the sea otter population. Don't miss visiting this attraction located on the edge of Canary Row. A cool exhibit is its live webcams showing marine life in their natural habitat. 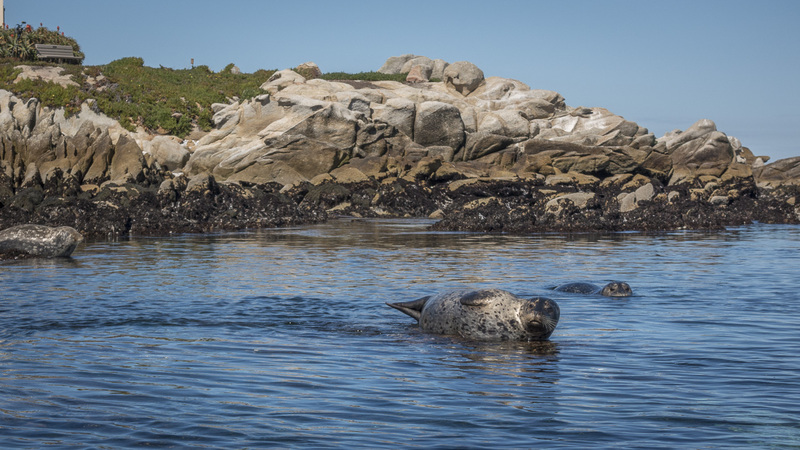 To really see wildlife in their natural habitat, we highly recommend taking a kayaking tour of Monterey Bay. We spent the morning kayaking the waters with Adventures by the Sea. 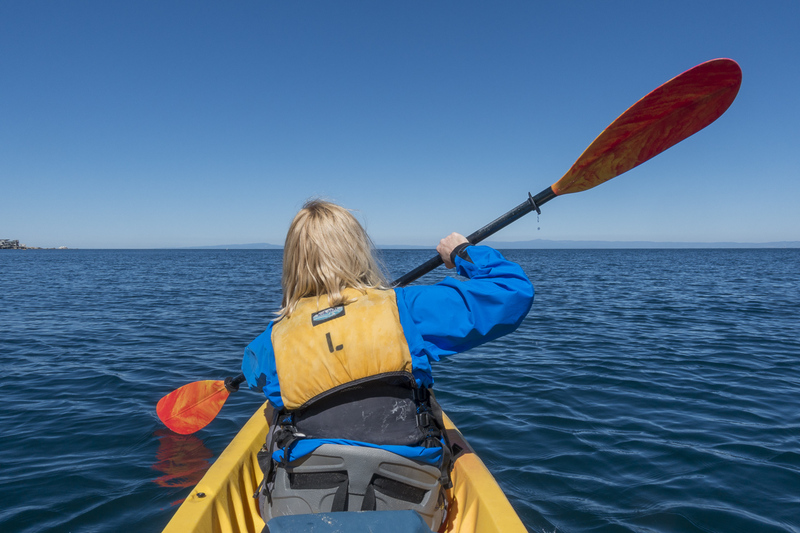 It was a pleasant trip where visitors can choose single or double sit on top kayaks that take you out to view sea otters, seals, and sea lions. The water is crystal clear and you'll view the incredible underwater kelp forest as you paddle through the marine reserve. This was a highlight of our trip along the California coast and we highly recommend it. What perfect way to get up close and personal with marine life. We didn't stay in Monterey and instead made our home base Carmel by the Sea. Clint Eastwood was once the mayor of the town so you can only imagine just how picture perfect it is. We stayed in the beautiful Hideaway Boutique hotel located right downtown and enjoyed a lovely buffet breakfast to give us the energy for the day ahead. If you want to spend longer than two days, you can easily make this your home base for sightseeing along highway 1. If you are moving on, make sure to give yourself time to explore its top sites. 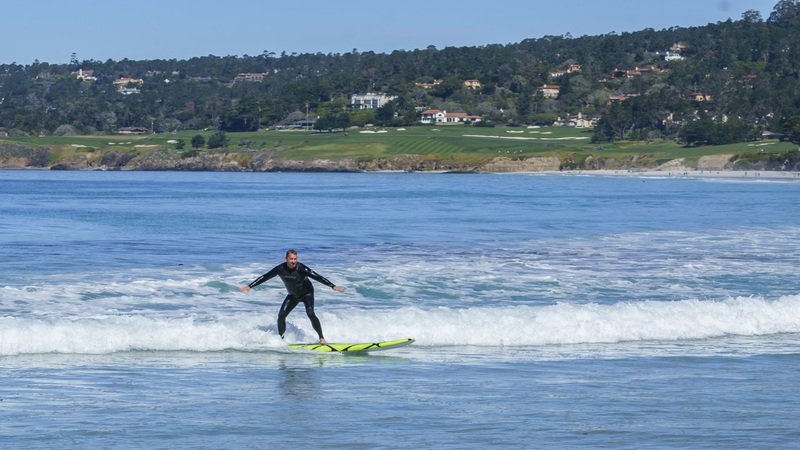 The surfing in Big Sur can be awesome, but beginners will love the easy break and sandy shallow waters of Carmel Bay. We spent the morning on the water getting our feet wet in the California surf. Dave loves his surfing experience in Carmel. 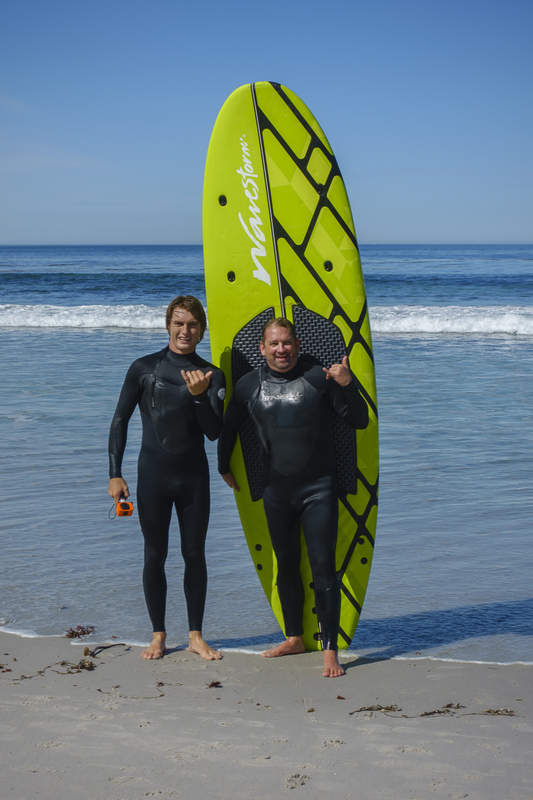 We met with Nick of the Carmel Surf Company for a morning lesson. He was patient and very knowledgeable sharing tips and tricks on how to catch a wave. Dave said, he could get into surfing after a session with Nick and that's saying something - we've tried surfing twice before and it definitely wasn't our thing. If there is one thing to do in Carmel before moving on, you must take a tour of 17-Mile Drive. An excellent way to explore the scenic views and stops of Carmel is to cycle the famous 17-mile drive on e-Bikes. Electric bikes let you zip through the streets with eases. It's not a difficult cycle at all, and you can rent bikes with Big Sur Adventures or take a guided tour as we did. The electric bikes do all the work as they propel you through the 17-mile long ride along the coast. We reached speeds of 25 miles per hour. The Ghost Tree of 17 Mile Drive. When cycling 17-Mile drive you don't have to pay the entrance fee as the vehicles do, and you don't have to share the road with motorcycles because they aren't allowed. You have the best of both worlds and can explore the famous views of 17 Mile Drive. 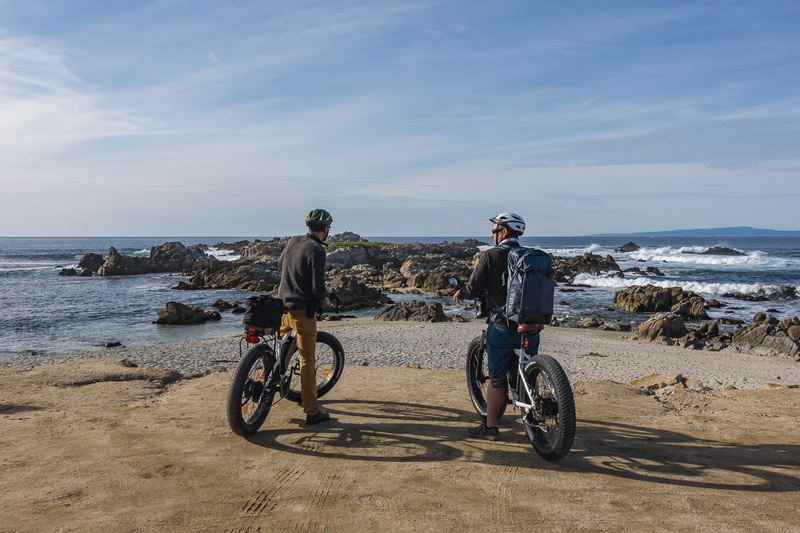 Read about our full experience at 17-Mile Drive - eBiking California's Most Scenic Drive. Centrally Located on Juniper Street, short walk to restaurants, just a few blocks from the beach. This luxury boutique hotel has in-room fireplaces and offers a modern design. La Belana Cucina Toscana takes you straight to the heart of Tuscany with a traditional setting. Sit outside on the heated patio and enjoy a fresh farm to table menu drizzled in olive oil and truffles. Download your Coastal Map of California for reference here. From San Francisco, you can either go along the Pacific Coast Highway towards Los Angeles or make your way to Lake Tahoe and start with the national parks. We did a trip where we went part way down the Pacific Coast to Big Sur and then turned around to visit Tahoe. It is all very flexible and up to you which way you want to go and what you want to see. But for this road trip to California, we're going to driver counter-clockwise down the coast to Big Sur. This is the wow factor of your drive and it's the Grand Dame of all California road trips. When exploring Big Sur we made a home base at Ventana Resort and spent two days exploring the surrounding area. Like everything in this California trip planner, the days are flexible. We are only suggesting the minimum time needed to take it in. Made famous by many a film and TV Show (most recently Big Little Lies with Nicole Kidman), the Bixby Bridge is probably the most photographed spot on the Coastal Highway. Tip: Go for sunrise no tourists were there at all when we were up before dawn. 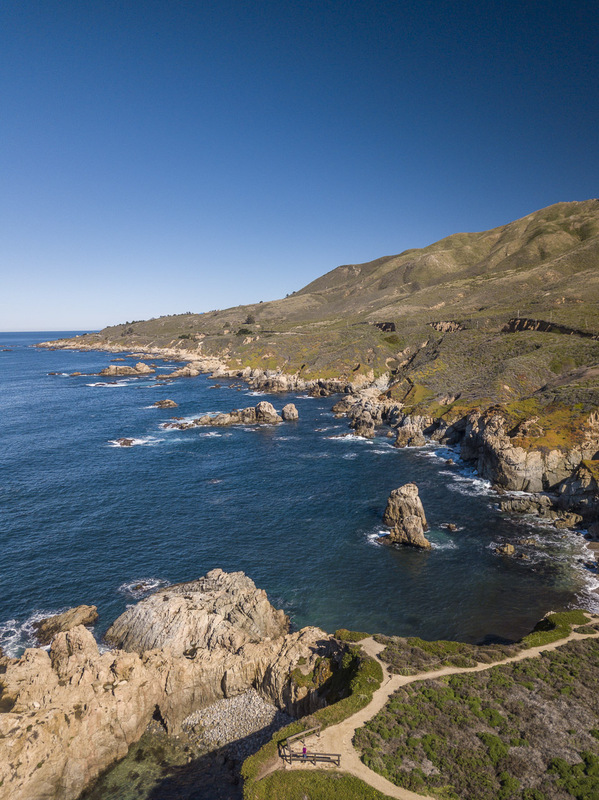 Considered by many the world's most scenic drives, The Big Sur portion of California Coastal Drive on Highway 1 is a must for any road trip lover. It weaves its way through mountains and jagged cliffs plunging into the sea. With secluded beaches, stunning sunsets and countless lookouts this marine reserve is a trip you'll never forget. Pfeiffer Beach is a bit of a drive off the main highway down a narrow and bumpy road, so it attracts fewer tourists than other viewpoints on highway 1. A beautiful beach to watch the sunset with arches, long sandy stretches for walking and dunes. If you are looking for great photography in a quiet setting, this is a superb choice. This a good place to go for hikes and walk along the trails. It's most famous for the McWay Waterfalls. Hiking trails along the coast. Karst formations, sea arches, and jagged rocks make for extraordinary views of a rugged coastal landscape. 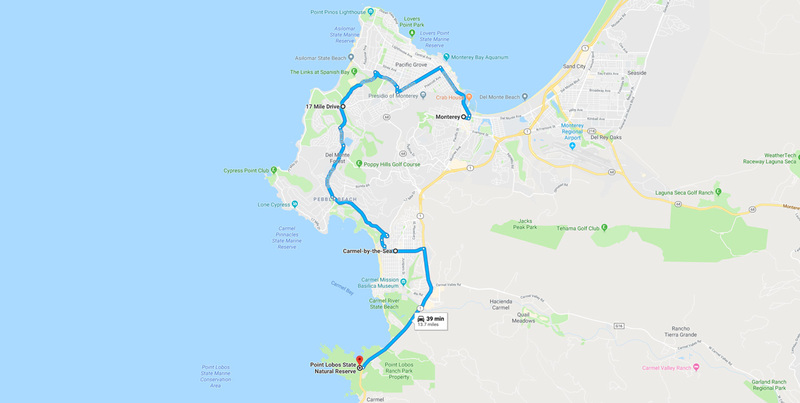 All of these are easily reached from Ventana Resort within a 30-minute drive. There are several hiking trails, beaches, campsites, and waterfalls. There is a reason that Big Sur is on many people's bucket list to drive at least once in their lives. We spent two nights at the luxurious Ventana Resort. Not ones to miss out on anything, we gave one night a try in their glamping tents and one night in their luxurious room overlooking the ocean. Ventana is the perfect base for exploring Big Sur as it's in the heart of everything. Each morning we could choose to go North or South to check out all the stops we've only until now seen in pictures. 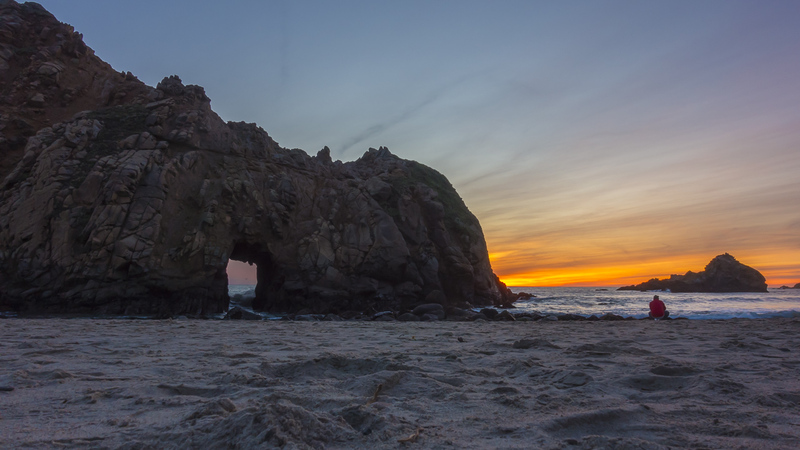 Ventana is just a short drive to Pfeiffer Beach which is an amazing spot to view the sunset. We then stayed a second night at the lodge with a private room. This is as luxurious as it gets in Big Sur. Taylor Swift and Mark Zuckerberg have stayed here and you could spend a couple of nights just enjoying the amenities. There are two swimming pools, Japanese baths, world-class dining, and spectacular views. 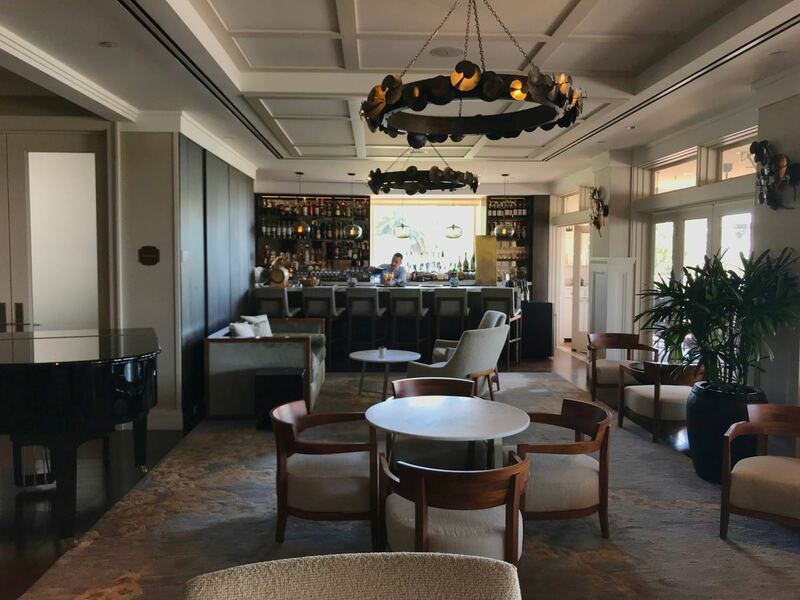 Located at Ventana Big Sur, The Sur House is an upscale dining establishment using locally sourced cuisine created by Executive Chef, Paul Corsentino. $90 Fix menu offers a divine three-course meal. The Big Sur River Inn was the first hotel and restaurant in Big Sur. Enjoy the photographs from a bygone era dating back to 1932. Sit in the Adirondack chairs in the middle of the Big Sur River as you enjoy a cold beverage while cooling off in the rushing water. Open since 1949, Nepenthe is a staple of Big Sur attracting artists, poets, and travelers to its 800-foot sea cliff views. Wine and dine on the terrace at sunset or shop at The Pheonix for Bohemian mementos. This locally run eatery has a funky vibe with family style seating. Designer Steve Justrich transformed the roadhouse into a unique design that they claim as homegrown modernism. Choose from the patio, couch or kitchen tables as you enjoy organic California cuisine. 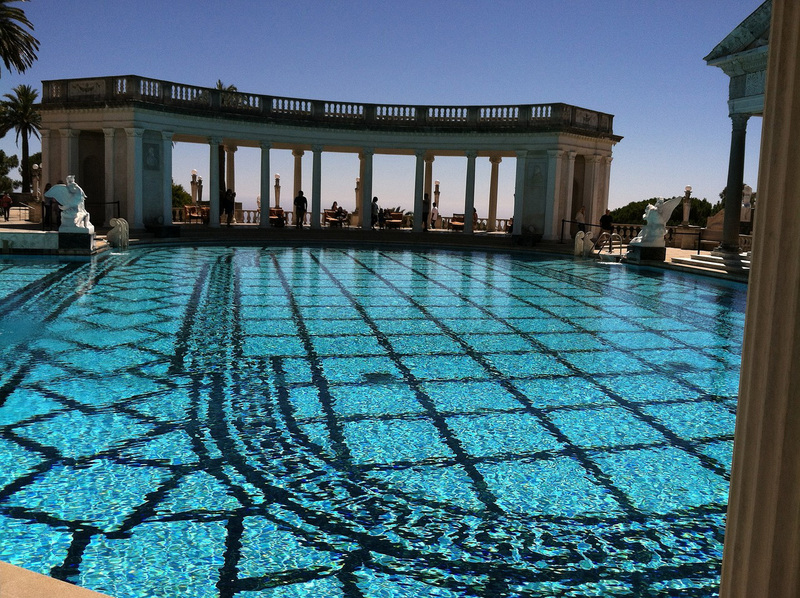 Get this portion of your California road trip planner on Google Maps. 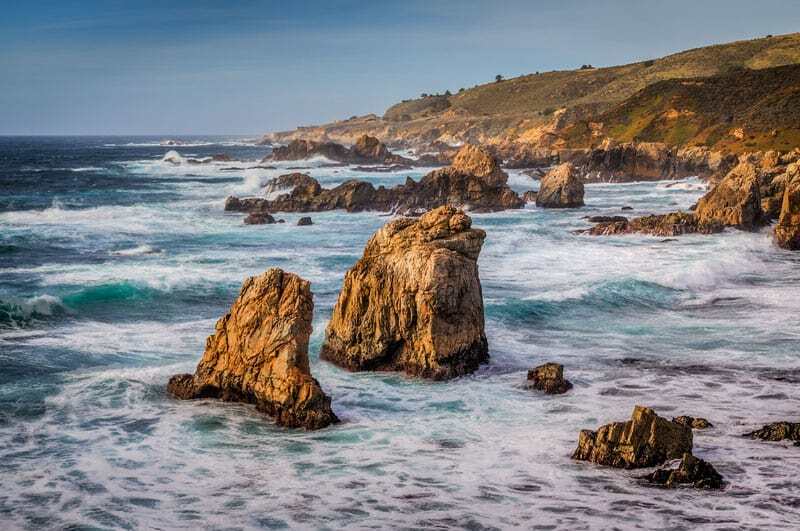 There is still a lot more to see on this portion of the California Coast and you can easily spend a day exploring the sites as you make your way to your next overnight stop. But make sure not to miss these two suggestions. 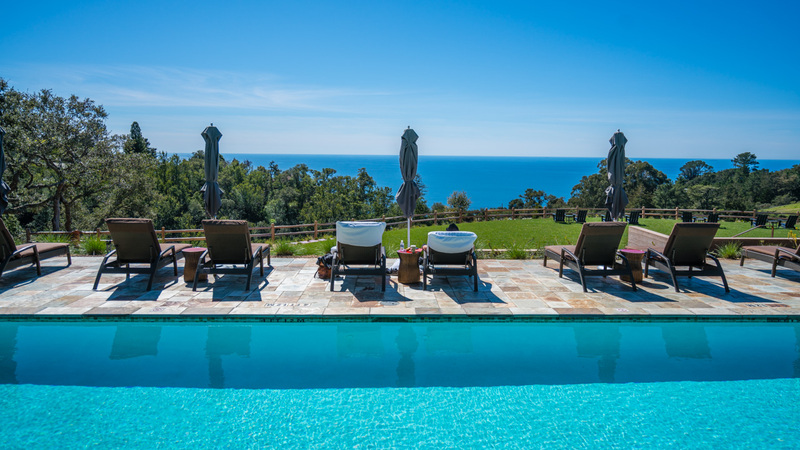 Built by San Simeon, this incredible estate was built on 127 acres on a hill overlooking San Simeon. Pop in for a tour of America's castle before driving on to spend the night in the lovely town of Santa Maria. En route to Santa Maria, make a couple of stops at these sites. 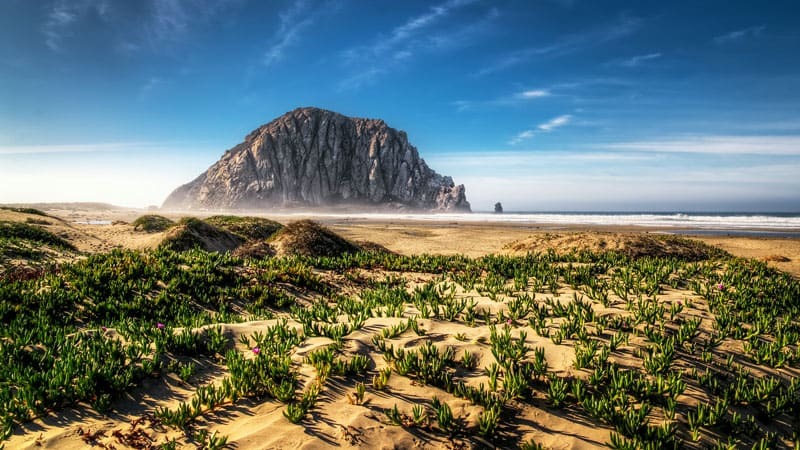 Another beautiful beach, Morrow Bay's main attraction is Morrow Rock, a 180-meter tall volcanic plug standing proud offshore. Pismo Beach is another place to stop if you still have time before spending the night in Santa Maria. California road trip itinerary 10 days - If you stop here and turn around. Get your map to complete the trip. Santa Maria is wine country. So it is a good time to park your car and get out to the nearby vineyards for a proper "Sideways" experience. Check into the historic Santa Maria Inn in the center of town. It has been a staple in Santa Maria since 1917. Be sure to peruse the halls to see legendary movie stars that have stayed here. There are a wine cellar and martini bar, and The Century Room is a lovely spot for dinner if you want to stay in after a long day's drive. 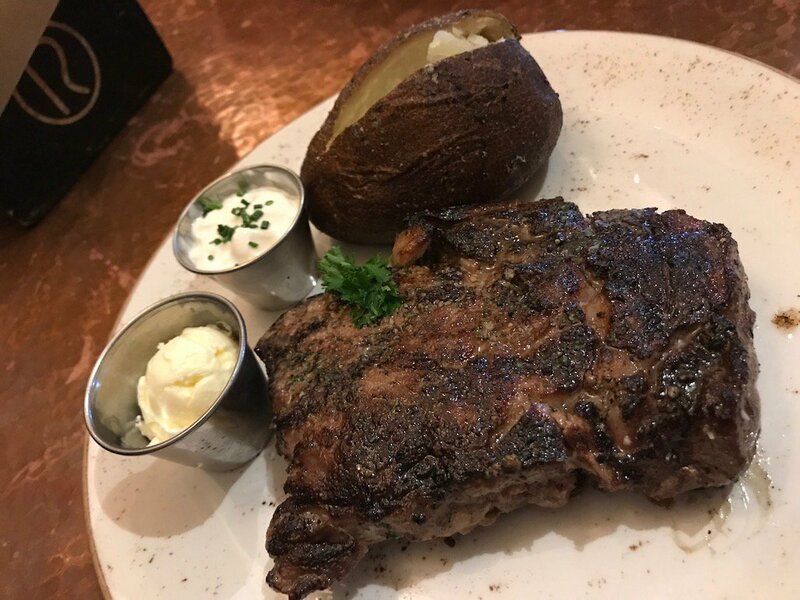 Known for the Santa Maria barbecue, you must make sure to head out to a local eatery one night to give it a try. We took some spices home with us! There are several vineyards to choose from, so we say, why make the choice? Instead, hire a private car through Gold Coast Executive Transportation to take you on a wine tour. They'll be able to recommend the best places to go to. We stopped to tour the Wine Caves of Cottonwood Canyon and had an amazing time exploring the unique caves. It was the first vineyard in California to build the subterranean caverns followed by a delicious tasting of Pino Noir. They put on live events in the summertime too. If you want to try authentic Santa Maria Style Barbecue, go to Far Western Tavern Tavern in Orcutt. Because you have hired a limo, you can enjoy all the food and wine you want! Today is a day for some sightseeing and adventure. You are in movie country, so make your way to The Hidden Hollywood at the Dunes Center museum in Guadalupe. This is the coolest things in the middle of the desert. In the 1950s, the legendary director, Cecil B. Demille created an entire set of the pyramids and Cairo in the middle of the California Sand Dunes. He didn't want anyone to use his set again, so he buried in the desert and didn't tell anyone where it was. It was nearly forgotten by everyone, until the 1990s when the director, Peter Brosnan decided to search for the hidden city. 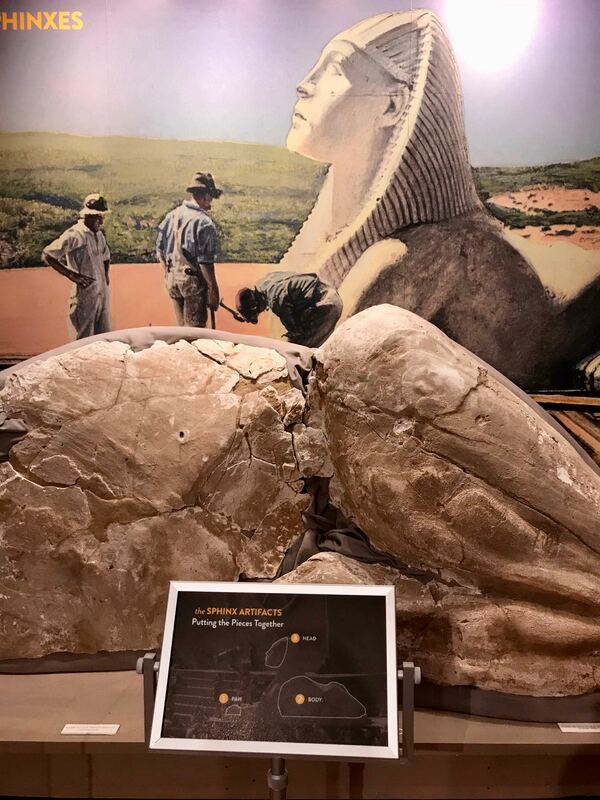 This museum houses the artifacts found including a giant sphynx head. To explore even more of the highest dunes in the world, go on a Dune Buggy adventure with Steve’s ATV Rentals, 332 Pier Ave. Oceano. Get in a dune buggy and hit the dunes. I thought it would be a walk in the park, but these dunes are huge and it took a bit of warming up to get up our nerve to drive up and down the dunes at full speed. It's a blast exploring the dunes that are located right on the coast. Before driving on to Los Angeles from Santa Maria, spend a night in Santa Barbara. We stayed at the luxurious Four Seasons Biltmore Santa Barbara. This estate is the perfect place to relax after all that driving. Santa Barbara is a popular escape from Los Angeles, and there are many things to do here. We suggest a sailing trip to enjoy the beautiful sunset and the California Coast followed by dinner on a patio by the waterfront. 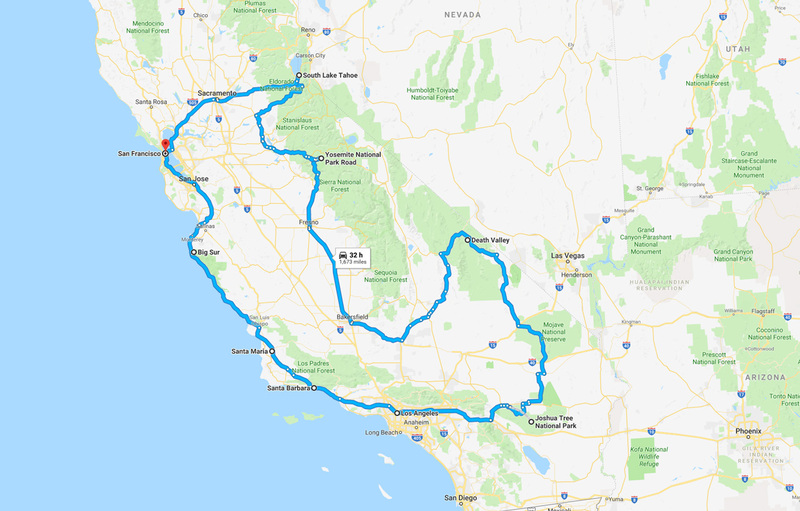 From San Francisco to Los Angeles you can easily create a 14-day itinerary, but you can also do this drive in as little as one day if drive straight through, so it is all really up to you! We've come to the next metropolis California Road Trip and it is time to explore L.A.
Who doesn't love Los Angeles? There are so many things to do in LA, that you could have your entire California trip right here. I could go into all the things you can do, but I am afraid that is an entirely different post to write about all the things to do here. But if you are ending your time in California here happy travels. If you have a few days, be sure to do something touristy like checking out the Hollywood Walk of Fame or popping over for a shot of the Hollywood Sign. Our favorite beach is Manhattan Beach where you can see the famous 90210 beach house. You seriously need a car to explore L.A. I hope you've rented a nice one to drive along Rodeo Drive but if not, don't worry, you'll fit right in with the Bohemian atmosphere of Venice Beach. A suggested place to eat in L.A: Our friend Johnny Jet swears by In and Out Burger. We have yet to try one, but everyone we talk to tells us to go for it. So how about you go for it and let us know how you like it! If you are looking for a place to stay, be sure to check out our post: Where to Stay in Los Angeles - 4 Hotels to Make You Feel Like a Star. 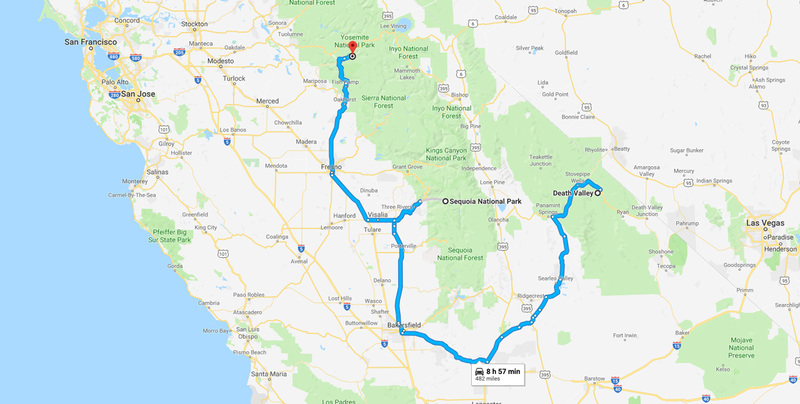 Get the Google maps of this portion of road trips California with a detour to Vegas map. As we drove through Joshua Tree we found it ironic that a song from U2's the Joshua Tree came on the Satellite Radio. They may not have found what they were looking for, but we certainly did. 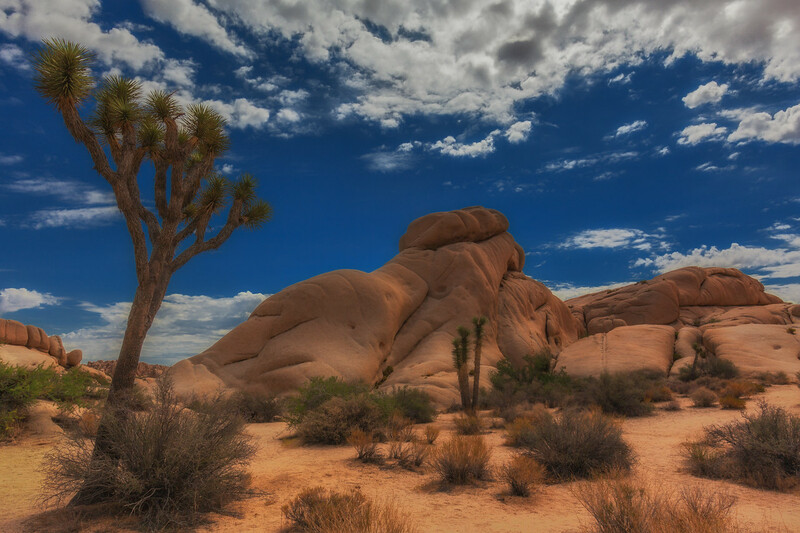 The Joshua Trees of this national park made for an incredible scene. We found ourselves stopping and hiking through the rocks and brush on a regular basis. There are lookout points and there's even a cactus garden. Located just two hours and twenty minutes from Los Angeles, I can see why this is such a popular tourist destination and a must do stop on any road trip. Joshua tree may be a desert. It is actually a place where two deserts meet: The Colorado Desert and the Mojave Desert. It's a much more pleasant temperature than Death Valley, so we recommend getting out and doing a lot of hiking. You can camp in Joshua Tree and there's also rock climbing. It's one of the premier places on earth for bouldering. We only suggest spending a day here on this California Road Trip Itinerary, but if you have more time, put a tent in the back of your car and spend a couple of days exploring. You can even do trail rides by horseback through this scenic park. Driving from Joshua Tree, I must admit, we took a detour from our California road trip and hopped into Nevada to see Vegas. You can easily do that too, but if not, continue on to Death Valley. This is one of the coolest driving experiences you'll ever have. 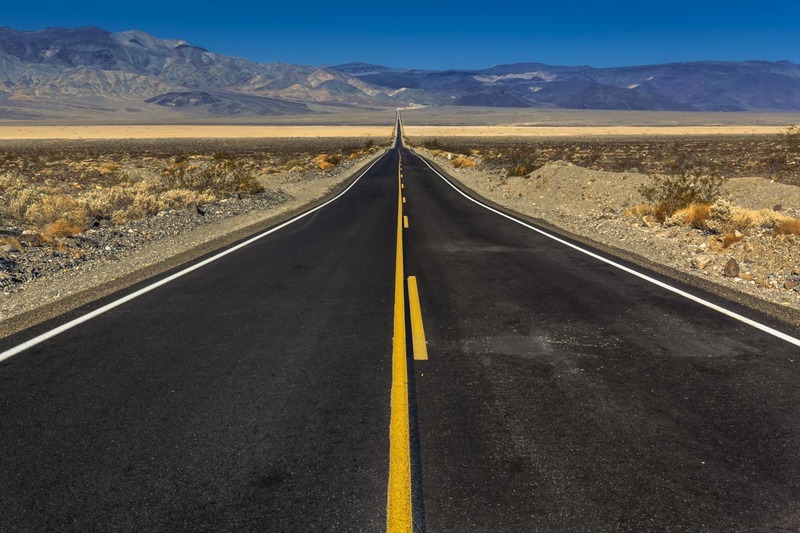 If you are planning a California road trip, you must try to include a day driving through Death Valley. We didn't stay overnight in Death Valley but there is lodging there if you'd like to extend your stay and make it a two-day trip. But we found one day was enough. It's a very hot, dry and a beautiful drive. 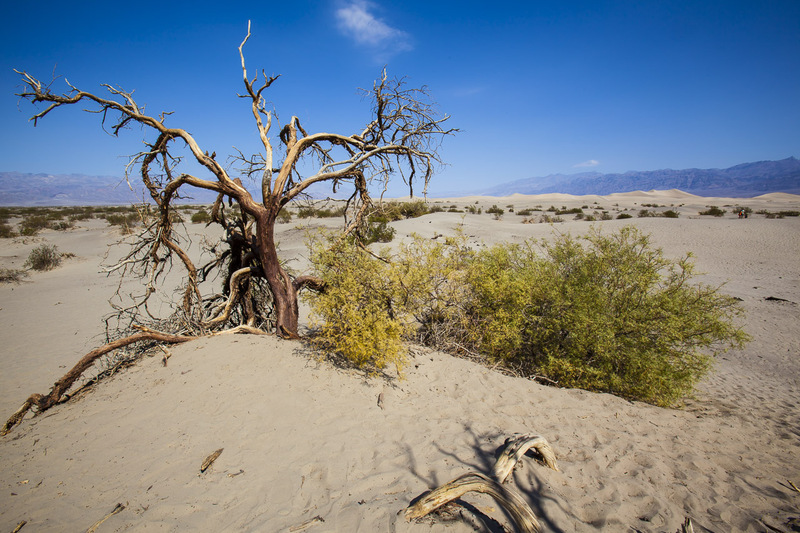 Saftey in Death Valley: Be prepared when you get out of the car, temperatures reach 120 degrees, so have plenty of water, cover up and pack that sunscreen. The long and lonely road of Death Valley made us think about the early pilgrims that settled in this area and we were grateful to have the air conditioning in our car. Death Valley got its name from a group of pioneers called The 49ers. They didn't listen to warnings of the dangers of crossing this unforgiving desert and faced extreme hardships over the coming months. They should have listened to their captain who took the long way around. Just stepping outside of the car to snap photographs was enough for us but you can get out and explore. Luckily there are enough stops at viewpoints along the road that keep you from having to trek too far for a view. I can't imagine crossing this by wagon train, but I am very glad we crossed by car. Yosemite National Park is a beautiful stop if you are a nature lover. It has all those iconic formations that you've all heard of like "the nose" and El Capitan. En route to Yosemite, be sure to stop at Sequoia National Forest. We combined our stay in Yosemite with seeing them as they are less than an hour away. Yosemite National Park is one of the Big 3 National Parks in the USA and it did not disappoint. It is where the legendary photographer Ansel Adams set up shop and took some of the most iconic photographs of all time. Dave took some legendary photographs himself. 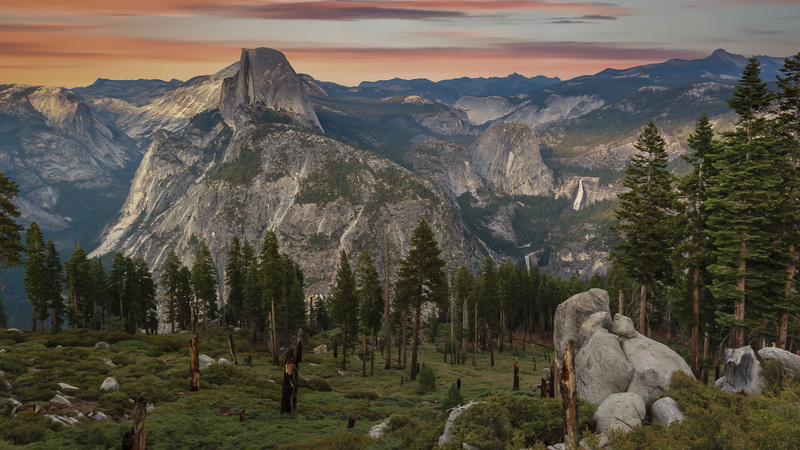 Yosemite is a photographer's paradise and every turn offered another stunning view. It's also a place for adventurers to get out an enjoy nature. There are so many hiking trails you will need days to complete them all. Or you'll just have to keep coming back again and again. 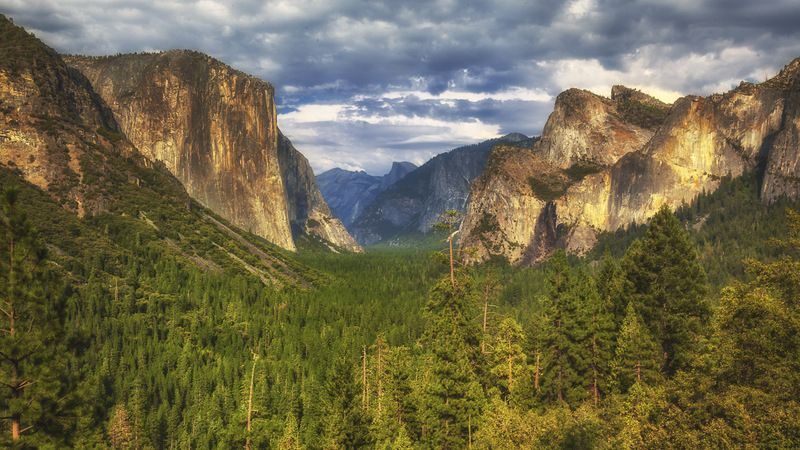 Yosemite Valley is the perfect spot for first timers featuring the top attractions. Here you'll find Bridalveil Falls, (is it just me or are there Bridalveil Falls everywhere you go in the world? ), the iconic Tunnel View Lookout and El Capitan. Glacier Point is another not to miss stop. Since you are on a California Road Trip, you'll have a car to get around easily to see it! It's quite accessible. Dave and I found that we spent a lot of time driving through Yosemite. I guess it is because we didn't have days on end to explore, but when we go back, we'd love to really delve into the many hiking trails that can take you to the backcountry. A highlight for us was taking the park tour to see the Grand Sequoia Trees of Mariposa Grove. It is a bit of a drive from Yosemite, but hey, you're on a road trip so it's right up your alley! It is here that you might remember seeing the photographs of cars driving through a tunnel carved through the trunk of a tree. They don't do that anymore, but the trees are still grand and amazing to see! Mariposa Grove is expected to open again this year, I can't wait to see what they have in store. If you have time and want to see more Sequoia trees, Sequoia National Park is located between Death Valley and Yosemite. 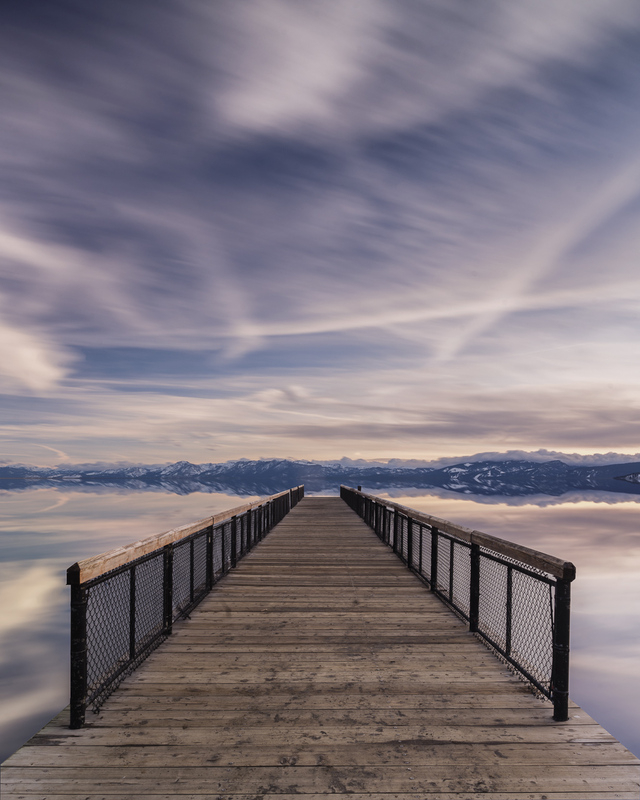 South Lake Tahoe is certainly the busier of the two sides of the lake in California. 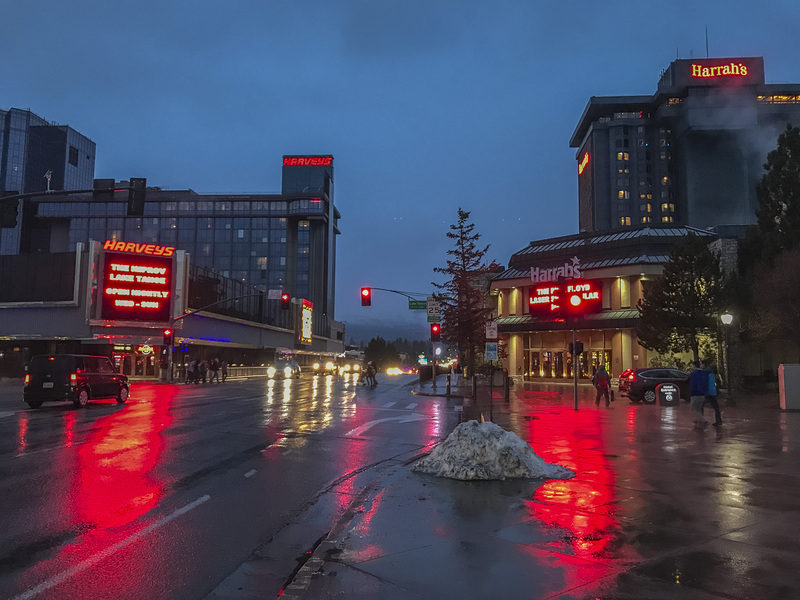 While the north side of the lake is all about nature, quiet family run lodges and rugged and historic ski hills, the South sits directly on the Nevada border and feels kitschy and commercial. It was nice to see the two contrasts though and we loved having so many choices to dining within minutes from our door. 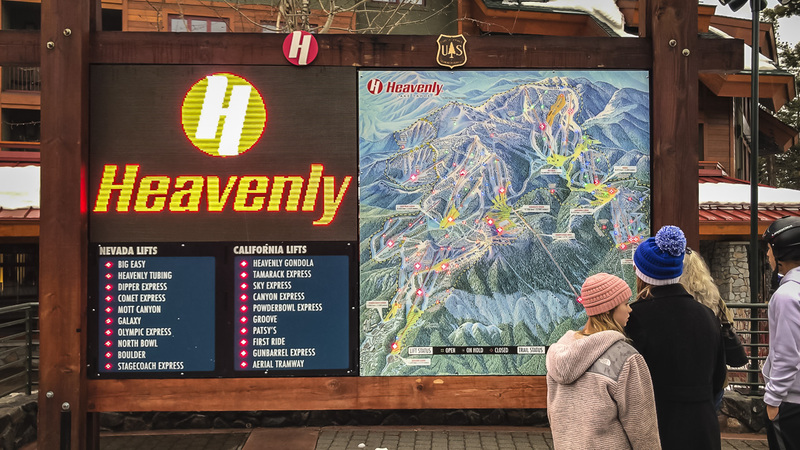 People come to South Tahoe for skiing and snowboarding at Heavenly Mountain Resort. Oh, how we wish the weather didn't turn on us the day we arrived in Lake Tahoe South. We were nearing the final day of our Catch the Winter Wave California Road Trip and while we had been blessed with sunny days throughout, by the time we reached the views of Heavenly, the rain had arrived. It was two days of fog and wet, but we did manage to explore the town and see more of the south shore of the lake. Being on the border of Nevada, the casinos were in full neon force with slot machines echoing in the night. We took a walk to the Nevada side as our hotel was located directly beside Bally's and instantly knew this wasn't our scene. It was a different crowd of bachelor and bachelorette parties mixed with young families flocking to the pool. 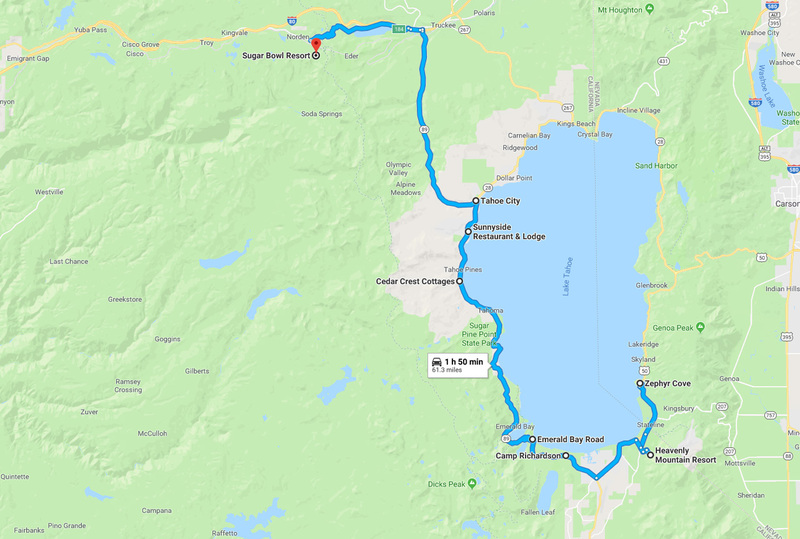 I think South Tahoe has marketed itself well for the party and family crowds, but for us, we would have preferred staying in the North with a day trip to the South. There are plenty of things to do in town to keep you occupied. There are plenty of bars and eateries and lots of coffee shops and shopping. 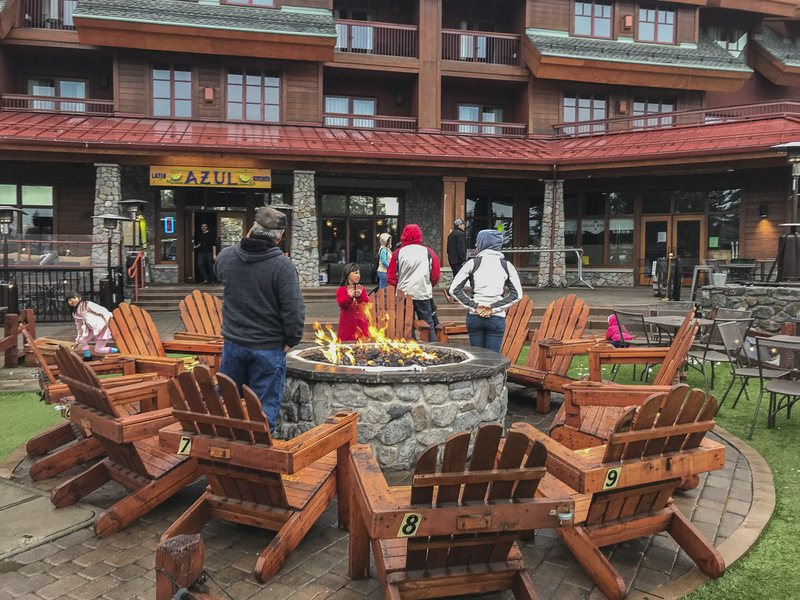 We enjoyed taking a stroll through the village at the base of the gondola to watch the kids skate on the outdoor arena and to sip a cappuccino by the outdoor firepit. If you don't like skiing or snowboarding, you can board the gondola for a view of the lake. 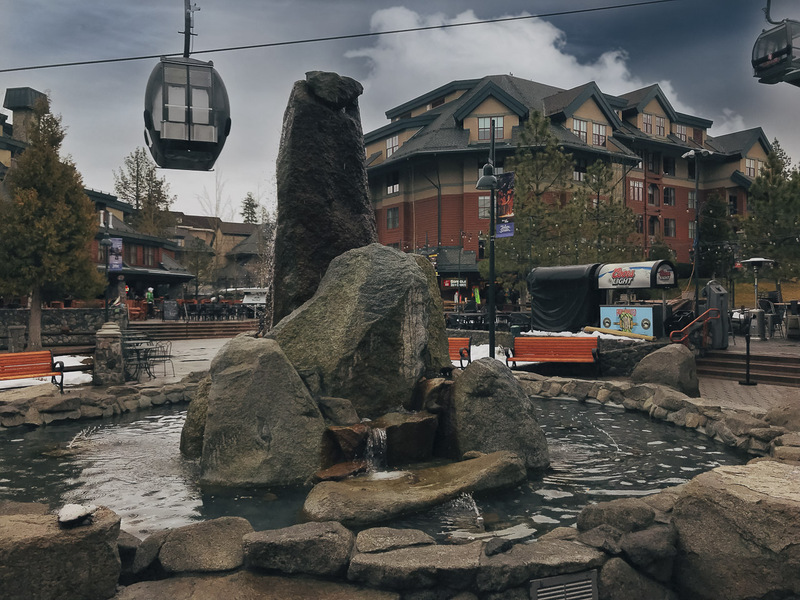 The 2.5-mile gondola ride will take you to an observation deck for a panoramic view of the Sierra Nevada Mountains and Lake Tahoe. You can also take a UTV tour at the top of the mountain. So once you are up on the Gondola, you don't have to rush down. Enjoy a snack at Cafe Blue, take in the views and hop on the UTV for a great outdoor adventure. While it's excellent to get as much skiing and snowboarding in as possible, there are other things to do for winter fun. Having a car is a must for this portion of your road trip as the drive around the lake is half the fun. After you've got your share of the slopes, hop in the car and tour around the lake. If you go full circle, you'll end up driving a portion of the trip through the neighboring state of Nevada. But the best views most certainly happen when driving towards South Tahoe via Emerald Bay. If you have some time, make sure to get out of the car and take advantage of the day hikes throughout the area. You can even rent snowshoes from Camp Richardson Mountain Sports to dig deeper into the backcountry. Warning: Be aware of avalanche warnings, we were told that there was a high probability of avalanches during our time in the area, and snowshoeing wasn't advised, so we stuck to the main trails. It takes an entire day to really explore the lake and you must give a lot of time for sightseeing at Emerald Bay. Something that really impressed us was how many pullovers California makes for road trippers to take in the views. These roads are made for a road trip! Emerald Bay has several different scenic stops and each one is a must! Don't just stop for one view, you're going to want to see them all. When you are driving south from Tahoe City to Emerald Bay, the only tip we can give you is just stop whenever you see a pull off. When you pull over, be sure to get out of your car and hike to the viewpoints. They get more spectacular with each turn! If there aren't avalanche warnings, you can snowshoe down to the bay and see the famous Vikingsholm Castle. The castle is closed during the winter, but we always like to have an endpoint to hike to and this is as good as any! Cruises of the Bay operate all winter. 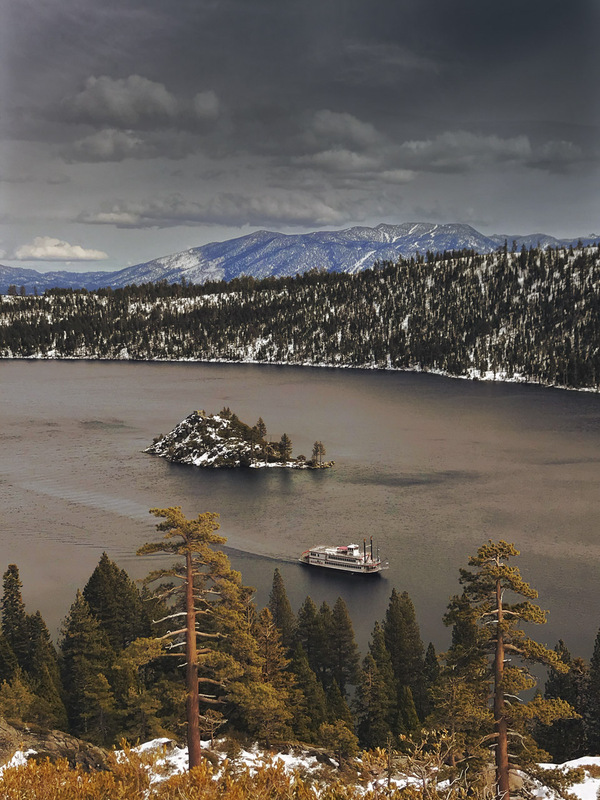 If you want a different view of Emerald Bay you can hop a cruise in South Tahoe's Zephyr Cove. If you are up for more hiking, there are trails all around Camp Richardson that are less steep than the hike down from Emerald Bay. There is cross-country skiing at Camp Richardson and they offer hotel and cabins for lodging. If you have your heart set on skiing Heavenly, it is only a 50-minute drive from Cedar Grove Cottages. We drove 50 minutes from our cottage to Sugar Bowl one way, so it wouldn't have been out of the question to drive the other way for Heavenly. I do know that many people like to be in the center of it all though, so if you want some action, South Tahoe is the place for you. But we enjoyed the quieter and more rugged atmosphere of North Lake Tahoe. 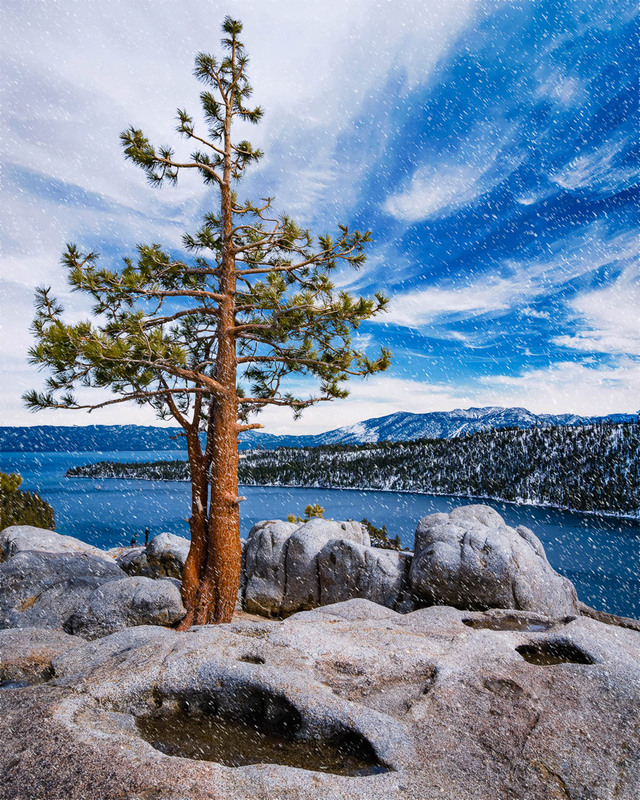 The mention of Lake Tahoe conjures up images of the stars playing on the slopes in their latest fashion while posing for photo ops. We didn't see any movie stars, but I can understand why this is such a popular getaway for Hollywood. 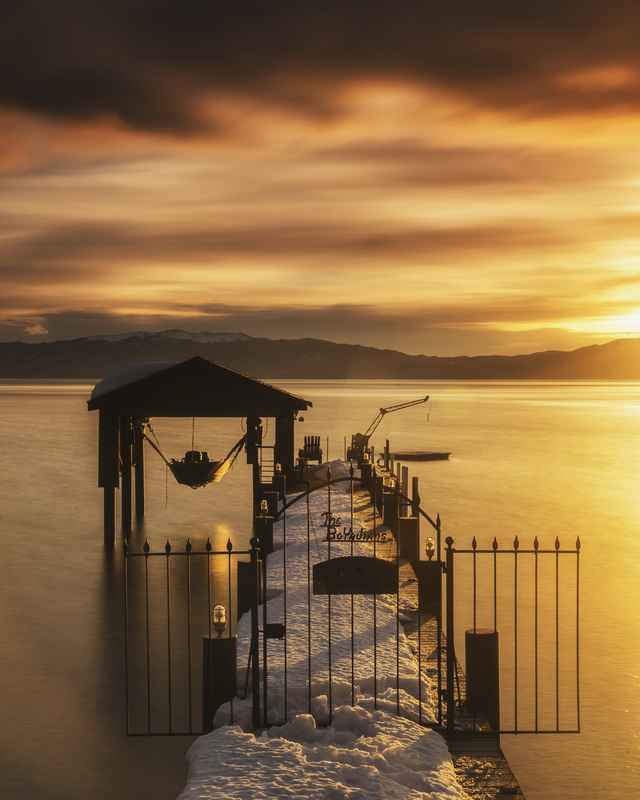 Lake Tahoe is stunning and simply driving around the lake will take your breath away, but there are a lot of winter activities to be had here as well. It is in Lake Tahoe that we continued our journey from catching the winter wave on the beaches of Big Sur to the slopes of Sugar Bowl Mountain. Lake Tahoe is blessed with 6 world class ski resorts including Squaw Valley, Home to the 1960 Winter Olympics. 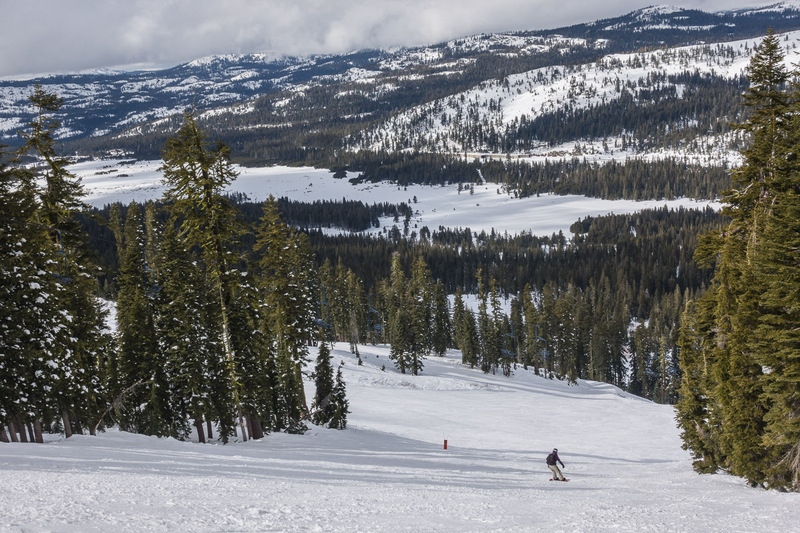 North Star offers the luxury end of the spectrum of skiing with the only slopeside five-star lodging in the area, and don't forget Mt.Rose offering Tahoe's Highest Base elevation. Sugar Bowl Ski Resort is the closest skiing to San Francisco and receives the most snowfall out of all the hills in California. It is where we went snowboarding while staying at Lake Tahoe's North End. It's a little out of the way, but it is worth a visit to escape most of the crowds. 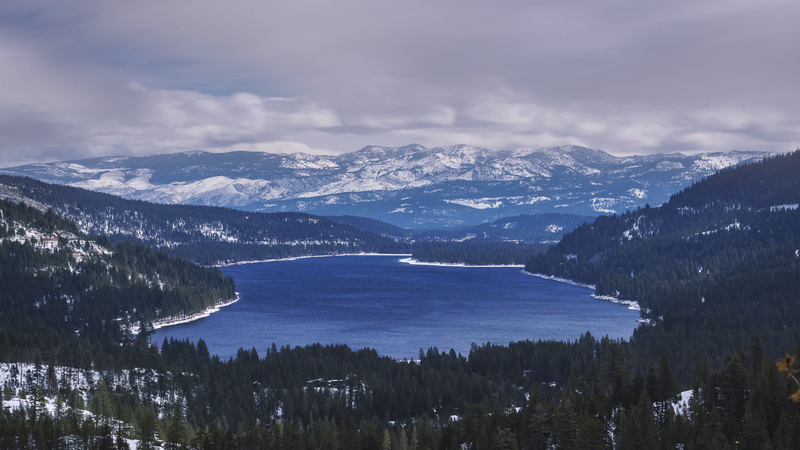 After driving up the long and winding road, we stopped for a magnificent view of Donner Lake. Make sure to pull over and take a look, we found it to be just as spectacular as Tahoe. For nostalgia purposes, it's got it all, as Sugar Bowl is also one of the oldest ski resorts in California dating back to 1939. It has that old world Swiss feel when you arrive. When you park in the main lot, you hop on a very old feeling gondola that takes you to the village where rentals and tickets can be purchased. We felt the rentals could have used a bit of an update and they gave Dave a snowboard that was a bit too small for him. We kind of felt that this resort could do better in the customer service area. But the views are outstanding here and we never had to wait in line for a lift. It's definitely more of a local resort and if you are into that type of getaway, it's worth a visit. We loved our meal and the friendly staff at Sunnyside Restaurant and Resort located at 1850 W Lake Blvd, Tahoe City. You could tell that this is not only a favorite of the tourist crowd but the locals alike. It was packed with people sampling their prosciutto wrapped prawns and fried zucchini - a Sunnyside tradition since 1965. The General Manager told us that he moved up from Los Angeles in the 1980s and never left! You could tell that the people who have chosen to live in Tahoe, love Tahoe and something tells me not a lot has changed in 40 years! You can also book rooms at Sunnyside and we would have loved to stay here relaxing by the giant fireplaces. The bar was so cozy and invited, we didn't' want to hit the road! We loved our fresh coffee and pastries each morning at West Shore Market located down the road on Lake Blvd. The evening we arrived after a long drive from Monterey, we sought this place out and bought some fresh cheese and bread from the deli and a bottle of California wine to relax at our cottage to sit back before our day of snowboarding. 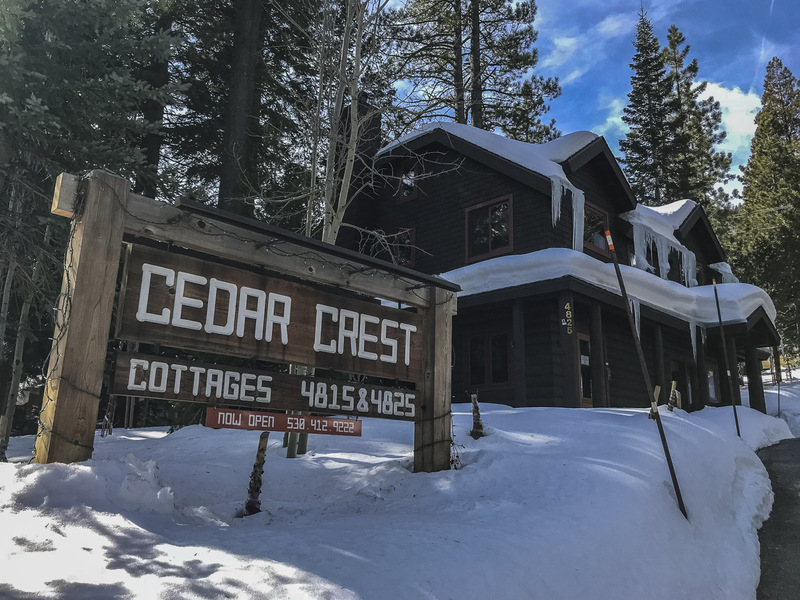 There are plenty of lodging options in North Lake Tahoe and a good stay for families would definitely be our lodge at Cedar Crest Cottages. Our cottage had two bedrooms, two baths, a living room and kitchen making it perfect for families that want to cook at home and have some space to spread out. It had a firepit that is put on every night until 10pm where you can roast some s'Mores over an open flame and it's located just across the road from the lake making it a very good choice for a summertime getaway. If you decide to take the full trip, it should take three weeks to complete. 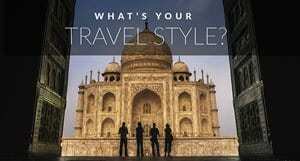 But you don't have to see everything and it is easy to create a 14-day itinerary or even a 7-day itinerary. It's up to you how much time you have and what route you want to take. Whatever route you choose, you will go through some of the best scenery in all of California. You can download the link on Google Maps. We have personally driven these routes and visited all the sights recommended. Our travels were split up between two separate road trips to California. One focused on the north and the other worked our way South. You can mix and match routes through California and go in either direction. We hope to have given enough information to create your own tour by offering these California road trip ideas. It is possible to see all these sights in two weeks, but three weeks gives you plenty of time to see it all at a leisurely pace. You have now completed the route and can make your way back to The San Francisco Bay area to return your rental car. It's about a five-hour drive from Lake Tahoe to San Francisco, so if you want to split up the 5-hour drive we suggest stopping in Sacramento. The state capital of California is worth a visit even if you only see the historic downtown landmark of Old Sacramento. This 28-acre district is filled with old town saloons and bars taking you back to the 1800s. A great place to stay is The Kimpton Sawyer Hotel that is just a short 15-minute walk from Old Town. This new upscale hotel is located in the heart of Sacramento overlooking the Golden 1 Center, home of the Sacramento Kings. And that ladies and gentlemen are our picks for the best road trips California has to offer. There is still an entirely other leg that we haven't done, including San Diego County and the entire Northern California coast from San Francisco to Oregon but that just gives us an excuse to go back! Do you have more road trip ideas from California that we should include in the future? To see our full itinerary through California check out Follow ThePlanetD from Oceans to Mountains on Visit California. Our trip to California was in partnership with Visit California. 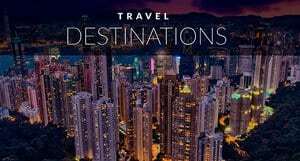 For more information on California travel and itineraries, visit their website. As usual, all opinions are our own. 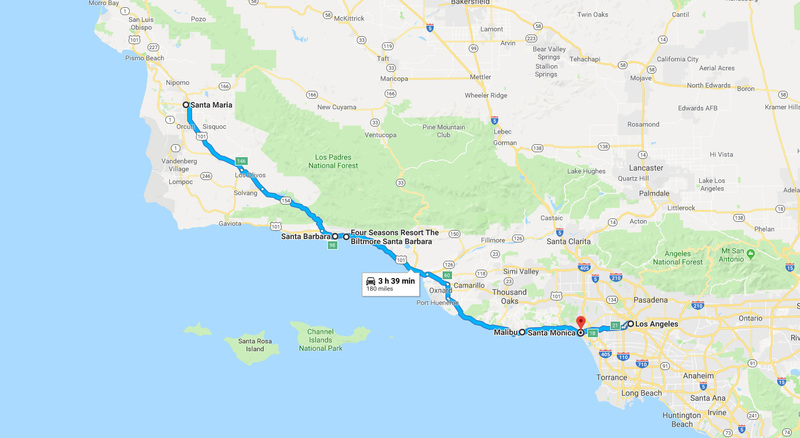 Enjoy this California Trip Planner? Why not pin it to use as a reference for future road trips. 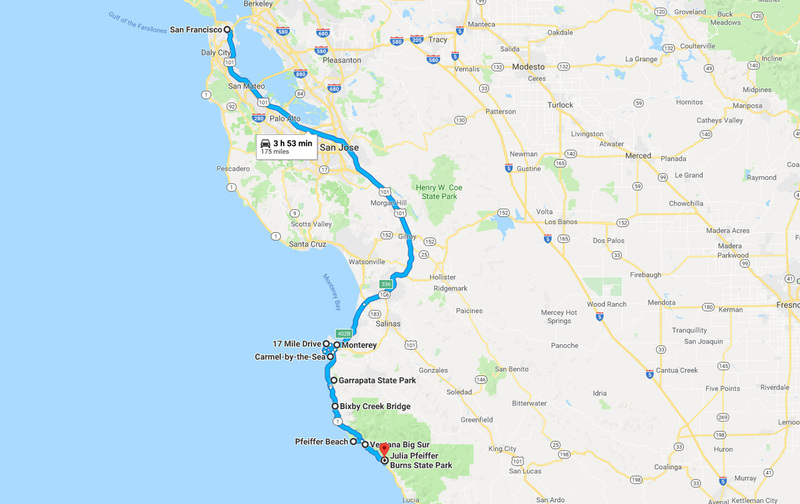 27 Responses to "California Road Trip – Planning The Perfect Two Week Itinerary"
This is a great itinerary! There is so much to see in California. 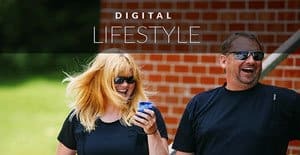 I have been creating CA road trip itineraries for 4 years of different duration and covering various interests. I currently have 35 and counting on my blog. I could not agree with you more about California being one of (if not the) best destinations for a road trip. Have you ever thought of renting a campervan to make the trip? It really makes the trip all the more immersive when you can stop and sleep right in the middle of it instead of having to venture off the beaten path to find lodging. And in most cases, you can do that in Cali. I recommend Travellers-Autobarn for an awesome campervan rental. They have locations in San Francisco and LA. I put their link in the website field. Happy Trails! Good to see wonderful snapshot of California and California road trip itinerary. California is just amazing and blog was so informative about the Joshua Tree,Los angles ,South Lake Tahoe,Yosemite,Death Valley i love these kinda places actually nice write-up thanks or posting! This post made me move towards road trip to California. Incredible post along with awesome photograph which is central attraction of the blog. Reading this post made my day. I wish I could travel like you without any worry of time. Appreciate it for your great effort that made my day with motivation. A California road trip has been on the top of my travel bucket list for so long and this post hasn’t changed my mind. I’ve been to both LA and SF but would love to see all the amazing scenery in between. This post makes me want to move home and go on a road trip! Thanks for giving me so many places to book mark. Can’t want to visit Cali again now! This is great and you photography is absolutely stunning! Although I live in California, there are several places on your road trip that I haven’t visited yet! I’m looking forward to getting to Lake Tahoe and Death Valley in the near future! Thanks for sharing! Wow, that is a serious road trip, filled with so many gorgeous things! When I was growing up, we did the Highway 1 trip several times, and I have so many great memories of it. This route takes you to all kinds of places I am yet to explore! Love it! 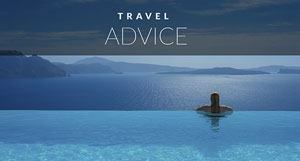 This is some great advice for our upcoming trip. I’m currently planning a road trip from San Francisco, so this is super helpful! Beautiful pictures you captured. Thank you so much for sharing this post. I just want to tell that your photographs are really very inspiring and they just got me. I wanted to meander in the streets of this state. Thank you for taking us on this part. Okay … just read over all the comments and I see a lot of people don’t care for Las Vegas. Fair enough. Please don’t right the whole city off as wasteful and uncaring for the environment. I’d ask you to please be open minded and learn more about our city before jumping to that conclusion. There’s more to Las Vegas than the four miles people know as the Strip. Get in touch regarding Las Vegas and anything you want to know about the Southwest. I’ve lived in Vegas for five years and know the Southwest well. Would love to chat about your plans and provide recommendations/answer questions. You know where to find me! We’ve been living in the bay area our whole lives and still haven’t done this route. SF direct to LA yes, but not this kind. Sounds like an adventure! I heard you two were at a Travel Massive event in SF late last year no? It was at a beer shop I believe. We were there too! Hi. That trip sounds amazing. I’ve actually been to all those places on a Trek America tour. Alcatraz is a must see, there is plenty to do in Vegas without gambling and if you get the chance to take a helicopter ride over the Grand Canyon do it because the views are to die for. You’ll have a blast! l look forward to reading about it. You guys are going to have such a great trip! I’m from the SF area, went to college in LA and spent several summers on family backpacking trips in Yosemite, so I have to admit I’m actually a little jealous. Enjoy it extra for me, please! Did a similar road trip last year and Cam is right, you need to stop by Sequoia National Park and see the General Sherman Tree (it’s basically on the way from Yosemite to Bakersfield!). With that said, still looks like tons of fun and I’m sure it’ll be a blast! Sounds like a lot of fun. I’ve always wanted to do a west coast road trip. I have driven from the Grand Canyon to Las Vegas, and I definitely did not spend enough time at the Grand Canyon. Las Vegas is fun, and as for shows any Cirque du Soleil show will be a good bet. I saw O which was fantastic. Seriously–you are driving right by some really amazing places with no time to stop. 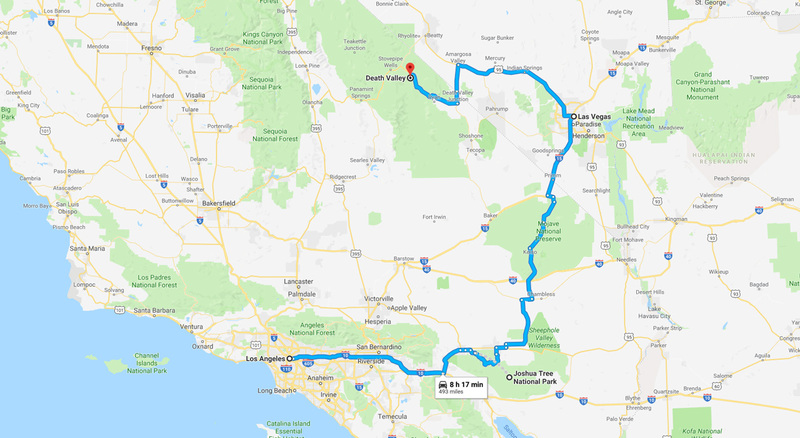 You have to add several more days and visit Sequoia National Park (world’s largest trees), and Death Valley National Park.They are both incredible! Las Vegas is soulless and weird and there’s nothing to do if you don’t like gambling (my friend Jane who lives there slaps me every time I say that–well, not really, but I can tell she wants to). Replace your time in Las Vegas with time in Sedona, Arizona, about an hour’s drive south of the South Rim of the Grand Canyon. Plus, Zion isn’t all that far from Bryce Canyon National Park, which is way better! How’s that for unsolicited advice! If you want to get out of California, these are all great suggestions. We need a year to really visit California and all the great States that Surround it. What a great route, including some mind-blowing scenery. Don’t spend too long in Vegas. We were disgusted by the excess and waste also. A sidetrip to the Hoover Dam would be an eye-opener as to just how much water is being sucked up. The water of Lake Mead will be so low by 2017 that they dam may not be able to produce any power. Whoa! I met Felipe from Twtvite in Berlin last summer. Cool guy! Sounds like the road trip will be a blast. Zion National Park is amazing! You’re not doing Highway 1 at all???? That’s by far one of my favourite road trips, between SF and LA!